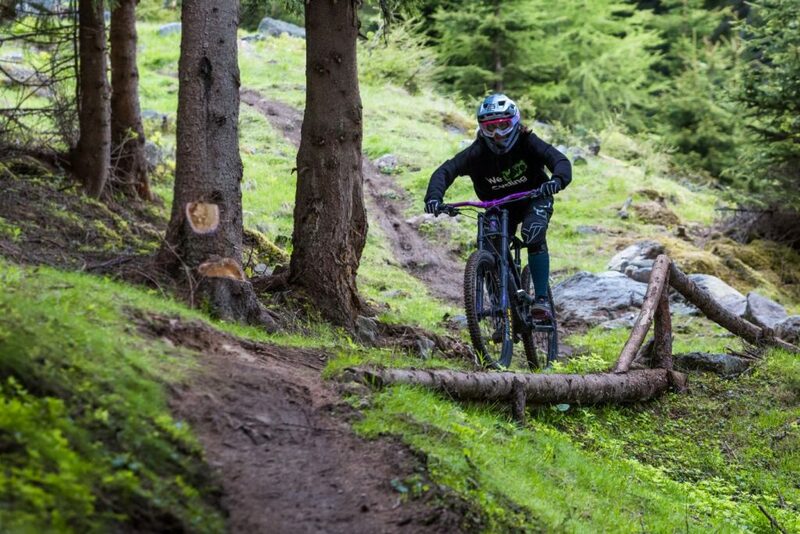 After saying goodbye to the German city of Stuttgart and artistic cyclist Viola Brand, Nina headed a bit more south to meet her next friend and athlete in a lovely alpine town named Neustift im Stubaital, Austria. Stubaital valley is the kind of place where you get the ethereal feeling of accidentally ending up in a fairytale setting. Nina Gutenthaler arrived on the arranged GPS meeting point but her company is nowhere to be seen. Or is she? Like a hawk, acrobatic paraglider Helen Schick plotted a little aerial ambush on Nina Gutenhaler, aka Miss Peaches, making a grand entrance on her paraglider and, at the same time, introducing her whimsical discipline. After a warm greeting, they get talking. Helen met with paragliding three years ago and claims it was a love-at-first-sight thing. “I knew I needed to try this since the first jump. Since then, I’ve been giving the sport everything. I quit my job last year and moved to Austria. Every minute the weather’s good, I spend flying. There’s no other way around it, you need to train frequently if you want to practice acrobatic flying; approximately eight times a day. I did 800 jumps just last year,” describes Helen with an omnipresent smile. If this isn’t dedication, we don’t know what is. 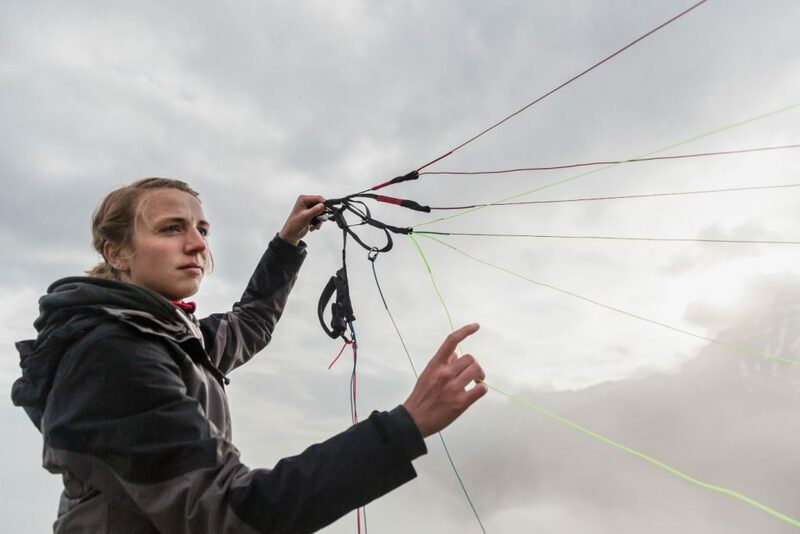 Helen Shick is one of the eight exceptional athletes Nina will be meeting on her travels. She was born in a tiny Austrian town of Bezau, hidden within the Bregenz Forest, brimming with ski resorts and hiking trails. That’s probably the reason Helen is such an adrenaline outdoor enthusiast – at 25 years of age, she’s heavily into snowboarding, climbing, biking, and, of course, acrobatic paragliding. But the love for all things exciting isn’t the only connecting link between Nina and Helen. Nina was also born in Austria and they both love to share their passion on various social media channels; Nina presents herself as an avid YouTuber and content creator. After inspecting the terrain, Nina noticed there’s a solid downhill trail right under the Neustift cable car’s path, which is where Helen usually trains. 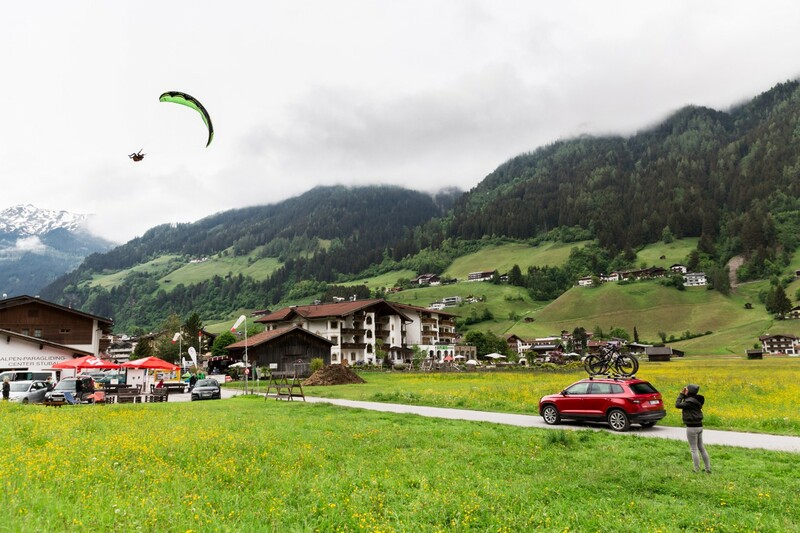 Our biker’s competitive side started poking its head and she suggested something extraordinary – one-of-a-kind downhill biker vs. paraglider race! Amused Helen agrees, even though the odds are probably in her favour, but Nina won’t have any of it and saddles up even before Helen manages to unpack her paraglide. 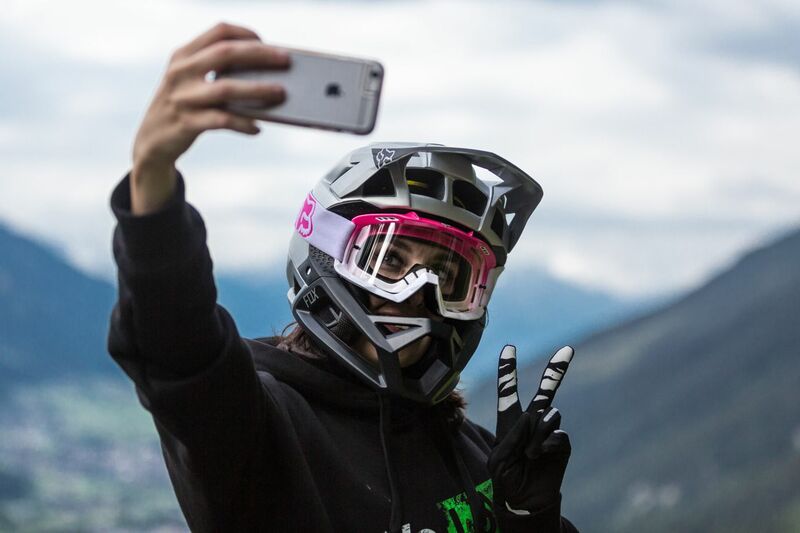 Nina is confident of her skills and even pauses on the trail to take a selfie, which she probably shouldn’t, because Helen descends on the “finish line” meadow minutes later, claiming a smooth victory. Nina took her defeat like a pro and Helen suggested a tandem paraglide as a consolation prize. Nina’s eyes light up and they meet at the top station of the Neustift cable car at 6 AM the next morning. After the mandatory instruction session, they take a few swift steps and up in the air they go! Unsuspecting Miss Peaches is enjoying spectacular views of the Stubaital Alps but Helen has an ace up her sleeve – a special acrobatic treatment, which makes Nina scream with either joy or horror, hard to tell. All goes well, adrenaline shoots high and Nina is exhilarated after a safe landing, claiming that everyone should try this at least once. After spending a pleasant afternoon together, we leave Helen to her amazing aerial world and saddle up for the next stretch of Miss Peaches on the Road! If you crave for more from Episode 2, we got just the right place.